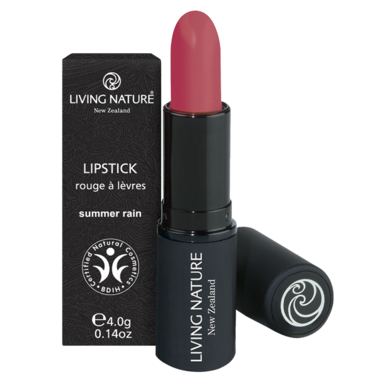 Living Nature lipsticks are formulated with the highest quality, synthetic-free ingredients to bring luscious, healthy color to your lips, without any of the nasties. Each lipstick is individually hand poured and flamed to a perfect finish. All-natural pigments and nourishing waxes ensure smooth application, fabulous wear, and a gorgeous smile. Ingredients:Ricinus communis (castor) seed oil, Caprylic/capric triglyceride, Euphorbia cerifera (candelilla) wax, Mica (CI 77019), Iron oxides (CI 77491), Cera alba (beeswax), Titanium dioxide (CI 77891), Copernicia cerifera (carnauba) wax, Iron oxides (CI 77492), Tocopheryl acetate (vitamin E), Vitis vinifera (grape) seed oil, Pyrus malus (apple) seed oil, Squalane, Glycine soja (soybean) oil, Tin oxide.